Amanda, a 28-year-old Los Angeles resident, used to go to church every Sunday. She still prays nightly and believes in Jesus, but now she has her own rituals. "I'll chant, or I'll go to Kundalini (yoga) and meditate with a group," said Amanda, who did not want her last name used because she's afraid religious groups will target her. She keeps a bunch on her nightstand and stows a small bag of them in her purse or backpack during the day. "The energy they hold is this ancient energy," she said. "It helps your own energy when you work with them, when you're near them." Amanda wasn't one of the respondents in a new Pew Research poll. But she fits right in. The poll shows that beyond a small band of reliably predictable "Sunday Stalwarts," as the survey calls them, American religiosity is pretty casual, with less than a quarter of Americans attending worship services weekly but nearly all religious groups adhering to some New Age beliefs. The poll, which grouped 4,729 Americans into seven types, found that though few Americans reject God altogether, most Americans mix traditional faith with beliefs in psychics, reincarnation and spiritual energy that they say can be found in physical objects such as mountains, trees and crystals. Taken in December, the poll examined beliefs and behaviors that cut across manyâ€¨ denominations using a method called cluster analysis, which produced seven broad religious typologies. The researchers gave these types pithy names such as "Spiritually Awake" and "Religion Resisters." Those who believe in no God Pew dubbed the "Solidly Secular." Overall, only 23 percent of Americans attend worship services weekly, and only one group — the "Sunday Stalwarts," who make up about 17 percent of the population — attend in overwhelming numbers. These include mostly Christians but also Jews, Muslims and Hindus who may attend on other holy days. In addition, the number of Americans who say they read Scripture daily, at only 11 percent, is strikingly low, and those who say religion is the most important source of meaning in their lives make up only 20 percent of the population. By contrast, New Age beliefs pervade all seven American types identified in the survey. "New Age beliefs are something we see many group members hold," said Becka A. Alpert, research associate at Pew, who worked on the poll. But she added, the study cannot explain why. Fully 41 percent of Americans believe in psychics including 32 percent of "Sunday Stalwarts," the most traditionally religious group of all. Forty-two percent of Americans believe spiritual energy can be located in physical objects. Smaller shares believe in reincarnation and astrology. Church Goes 'Wild' as Believers Head for the Trees—But How Is This Different From Paganism? The group with the most New Age beliefs was what researchers called the "Diversely Devout." This group, which makes up 11 percent of Americans, consists of Protestants and unaffiliated Americans, the so-called "nones." Among this group, solid majorities have New Age beliefs. This is the group that snaps up "smudge sticks" or "sage bundles" — material for ritual or spiritually cleansing burning — and invests in crystals and gemstones touted as possessing energy capable of helping people heal from emotional, physical or spiritual pain. 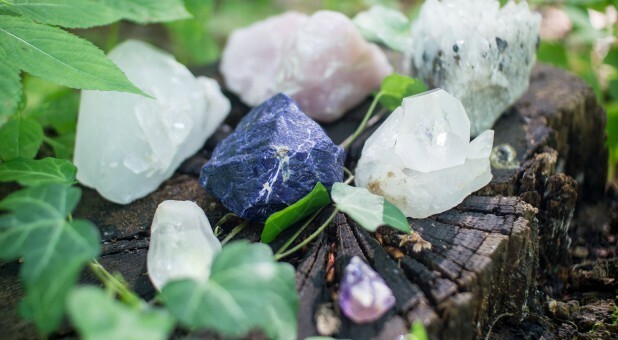 Crystal enthusiasts say moonstone invokes creativity, citrine boosts energy, and amethyst treats addiction. Other practices such as yoga, meditation, reiki, ayurvedic medicine — not all New Age — are fast gaining practitioners. "New Age practices are unstructured," said Jeffrey Kessler, a Jew who is the president of his Berkeley, Calif. congregation Chochmat Halev but also teaches tai chi, and engages in somatic healing, which combines psychotherapy and various physical therapies to heal trauma. "There's no authority. People can pick and choose and explore. I think of it as a spiritual freeform way of beginning to connect to something other than oneself." Mark Chaves, a sociologist at Duke University who studies American religiosity, said he'd want to look at other surveys to see if the Pew numbers for New Age beliefs are particularly high. But he added: "It does strike me as interesting that belief in supernatural-ly kinds of things is more prevalent among the conventionally religious." * 56 percent believe in the God of the Bible. * 61 percent believe God will judge people based on what they've done. * 77 percent say God or a higher power has protected them. But only 33 percent of Americans say it's necessary to believe in God to be moral and only 31 percent rely on their religious teachings "a lot" to help them make decisions about right and wrong. Some scholars have argued that society is not necessarily becoming more secular; instead traditional religions are giving way to new forms of spirituality that are supplanting, but not always replacing churchgoing. That was the thesis of a 2005 book, "The Spiritual Revolution: Why Religion is Giving Way to Spirituality." That makes sense to psychotherapist Stephanie Anderson-Ladd of Durham, N.C. Ladd works with women who feel alienated by patriarchal religions and helps them connect with the divine feminine through goddess archetypes that can serve as models. "A lot of people have been turned off by organized religion," she said. "They're exploring alternative ways of being a spiritual being on a human path, as much as a human being on a spiritual path. We're open to many different ways to understand the divine." Â© 2018 Religion News Service. All rights reserved.